Laaaaawwwwwdddd. So I totally told you people that I was going to be enlisting your help. Hello free design service! Let's face it...you all know best, and I trust your opinions implicitly. As you all know, I am searching for THE perfect bed for our new house. I have combed through various options: Tufted, nailhead, tufted with nailhead, footboard, no footboard, neutral, patterned, buy it, make it, have it made....you get the picture. I am usually not completely indecisive but this is a big decision. Big. Priorities, people. Ok, so before we get started, a few things to consider. 1.) Bear in mind, the room is going to be painted a slate gray color. Hence why I am leaning more towards a neutral color for the bed. This is non-negotiable. 2.) Our room is literally going to be a "bedroom." This is an older house and the rooms are definitely not the most spacious. That being said, the room will house a bed and a pair of nightstands. Only. Ok, ok. I am so ready for your opinions. Hit me with them! Option 1. Tufted headboard and footboard in a neutral. Ok let's be honest. Solid white is what I am thinking here. Glammy touches like mirrored nightstands and a metallic cowskin rug. Thoughts? Option 2. Again, another neutral tufted bed. Only this time, it is a sleigh bed! Oooohhh. Ahhhh. 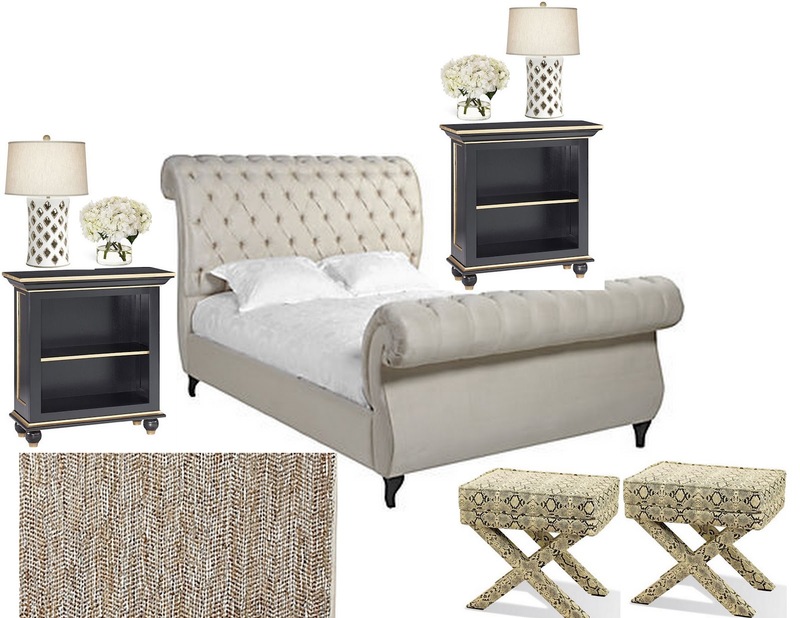 This room will be glam but also have some masculine touches, ie the black nightstands and python upholstered X-benches. Let's not forget the metallic suede rug. I need this in my life. Now. Option 3. Completely different from all other options. This is us just throwing out the script, folks. A patterned nailhead headboard. Now, keep in mind, it does not have to be this pattern. I am just like the look monochromatic look. Who doesn't love a silver leaf side table? Exactly. This option will be as if we have stepped back into black and white television. Me likey. Thoughts? Opinions? Suggestions? Again, I am in the process of reupholstering some other pieces in my home and could just as easily throw this project at my upholsterer. Decisions, decisions. choice number 1 for sure! LOVE it! I am totally leaning towards this as well! I know I will have to Scotchgaurd the hell out of it before we actually live with this option. I am just set on the neutral! Well, I can see why this is such a hard decision. You have 3 fantastic options! I like elements from each. I like the headboards in option 1 and 3. We have a sleigh bed, and it's a hassle to change the sheets and tuck everything in perfectly, so personally, I'm over it. I think Headboard 3 would give you a lot of versatility in selecting the fabric and recovering down the road if you wanted to change things up. I'm loving options 1 and 3, but I think my vote is going to #3. It's unique and sophisticated and practical. Can't wait to see what you do. Good luck! I definitely will pull other elements in from each design for the final. Thanks for your suggestions! Love them! Choice 1 for me all the way! I love the white tufted bed, such a classic...and you can change it up so easily when you get bored with pillows and bedding. Can't wait to see what you do..it is all fabulous! So glad to see you are back in action! Have missed you! I am leaning towards this option as well. Can't get over the neutral and the tufting. So classic. oh yes, i see your dilemma. it's hard when all three are fantastic options! i love the white tufted headboard, but you may have won me over with option #2 with those python x-benches! I am dying over the x-benches as well. I know the boy will go for them also! 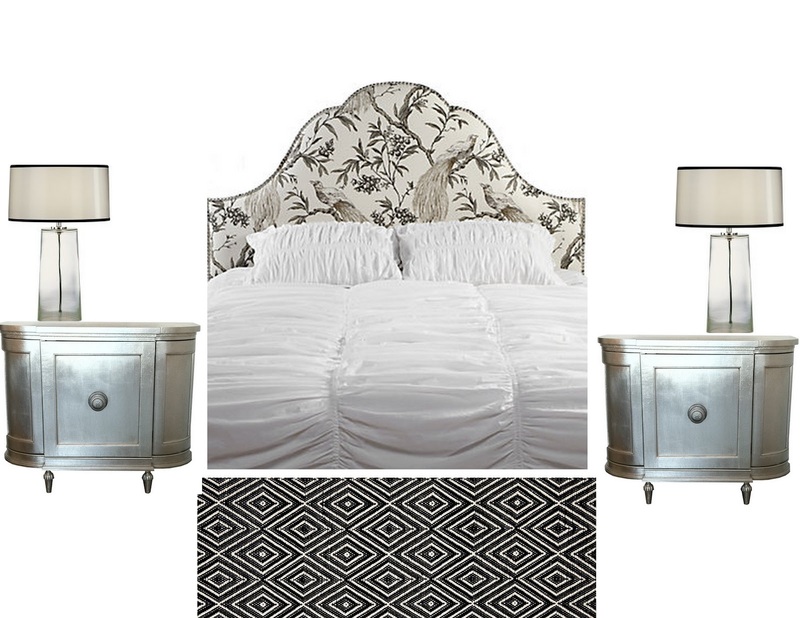 :) I think the white tufted headboard wins. I love option #3 good luck! So hard to decide!! 1 & 2 are my faves, that cowhide is spectacular! My favorite headboard is #1. Favorite nightstands #2. I need a place to hide my junk. They are all fabulous. I need a junk drawer as well. Gotta conceal the hoarder in me! #3, because it's little more unique, I love the nightstands. As beautiful as #1 is, I feel like it's been done a lot. Can't wait to see it! In my mind it is a tie between 1 and 2. but I am thinking 2 has a slight lead! I really love it! I'd say #1 although I do love the addition of black in the second one and those snakeskin benches are to die for! It is a nice contrast. For sure! I like option 2 better for the bedroom. It just feels more calming and relaxing and I like that it has contrast with the dark nightstands. #1 seems like it would be too hard to keep clean with the mirrors and the white headboard. Good luck! I agree! A total sanctuary! I am leaning towards this option! I like the first one best! Tufted is so classic. Loving #1. The tufting is winning my heart these days. Option #1 is lovely all the way around. Go for it!! All are gorgeous, but def #1 for me! I am seriously loving look #1 and 2! That metallic cowhide is gorgeous and that tufted sleigh bed is out of this world! I need some metallic floor coverings in my life! Option #1 is shazam! Amazing!!! I like option 1 the best, but lean towards the nightstands in option 2 and the lamps from option 3. Have you ever thought about mixing up the lamps or even just the lampshades? I'm not a fan of overly matchy-matchy stuff. I'm all for symmetry and cohesion, but it seems a bit much. Hmm. That's a tough one. All good options! I'm going against the grain here and voting for option 2. But I'd go for a pop of color with the x-benches. Just sayin. I like the bed and rug from the first one with the night stand and accessories from the second one. I LOVE tufted head boards, so I think they are all fabulous. #3 with the rug from #2. If your room is not too spacious- then best to probably stick with a bed that isnt too heavy.... and I think that the upholstered footboards make you room seem tigher.. I have to go with choice #3- I love the large pattern idea for the headboard and the rest of the items in this space are my favorite too. Cant wait to see what you go with!! I am LOVING all of your opinions/suggestions. You guys are the smartest and most talented. Ever! Hoping to reach a decision on the bed by the end of this week. 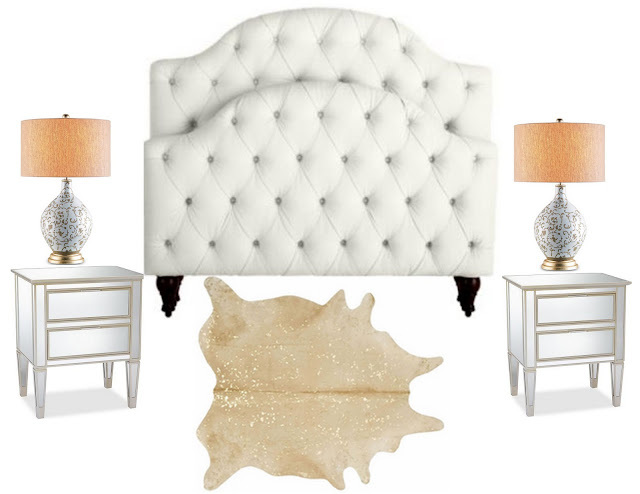 Leaning towards a tufted, cream option with glammy accessories. Shocker. Oooh, so pretty! I love all three looks but agree with an above poster, I think I would get sick of #1 faster than the others because I feel like it's been done before. I'd mix and match! 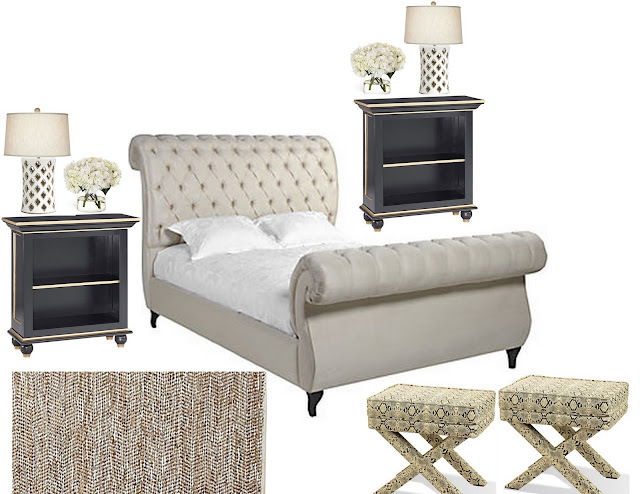 I looove the headboard from 3 with the nightstands/X benches from 2, probably with the rug from 1 to get a few more curves in there (and some glam!) Can't wait to see how it turns out! I love the bed from #2 option. It is gorgeous. Do you know the brand? Love the night stands from #3. Unique and yet classy. Good luck.